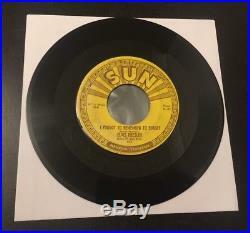 Elvis Presley - I Forgot To Remember To Forget / Mystery Train, Original SUN 223, 1955. Elvis Presley - I Forgot To Remember To Forget / Mystery Train. Matrix U-156x 20 / U-157x 20. The vinyl is in VG+ condition. There are a few surface hairlines, but the record still retains its deep gloss. It plays through very well with only minimal background hiss, which is typical of all early Sun recordings. Labels are clean, with only some light fading. 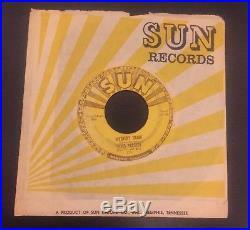 Original Sun Records sleeve in great condition with only some feathering to the top opening. Elvis Presley recorded the most famous version of this song on Sun Records in 1955. His version was ranked #77 on Rolling Stone's 500 Greatest Songs of All Time, and is his best-known song that was never a hit - it was released as the B-side of I Forgot To Remember To Forget. 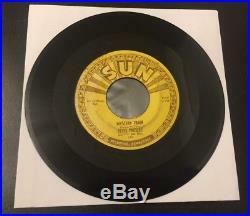 The item "Elvis Presley I Forgot To Remember To Forget / Mystery Train, Sun 223, 1955" is in sale since Friday, August 17, 2018. This item is in the category "Music\Records". The seller is "vinyldelights" and is located in newcastle, Tyne and Wear. This item can be shipped worldwide.